A new survey of 557 female scientists found widespread experiences of discrimination and alienation in the workforce that varied in interesting ways by race. Black women were especially likely to need to prove and re-prove competence. 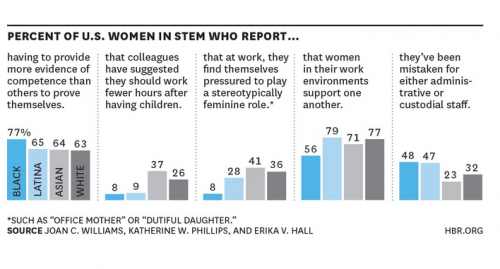 Asian and white women, especially, received pressure to withdraw from the workplace after having children. Asian women were most likely to be pushed to perform a stereotypically feminine role in the office, followed by white and then Latina women. Black women rarely reported this. Latina and white women were most likely to feel supported by other women in the workforce; Black women the least. And almost half of Black and Latina women had been mistaken for janitors or administrative assistants, compared to a third of white women and a quarter of Asian women. The study, by law professor Joan Williams and two colleagues, can be found here. But...but how can this be? Both Fox news and various internet intellectuals say that there's no racism in the U.S.!